Combine the flour, sugar, baking powder, salt, and cinnamon in a large bowl. Stir in the walnuts and cranberries. In a smaller bowl (or a 2-cup measuring cup), combine the eggs, milk, and olive oil. Make a well in the center of the dry ingredients and add the wet ingredients. Stir just until barely combined and then gently fold in the zucchini. Spoon the batter into a greased, 12-cup muffin tin. Bake for 20 to 25 minutes or until the muffins spring back when you press them with your fingertips. Cool 5 minutes on a rack. While the muffins are baking, prepare the frosting. 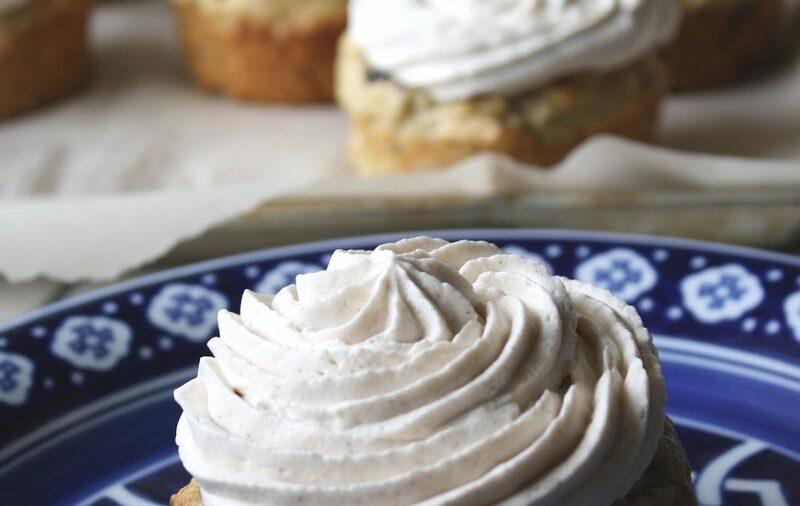 In a large mixing bowl or in the bowl of a stand mixer beat the cream cheese and sugar and cinnamon until smooth on medium speed (about two minutes) slowly add the cream and continue mixing until thick and spreadable, approximately two more minutes. Refrigerate the frosting until the muffins are cooled to room temperature. Frost and enjoy! Original recipe and photo by Veronica Foods.